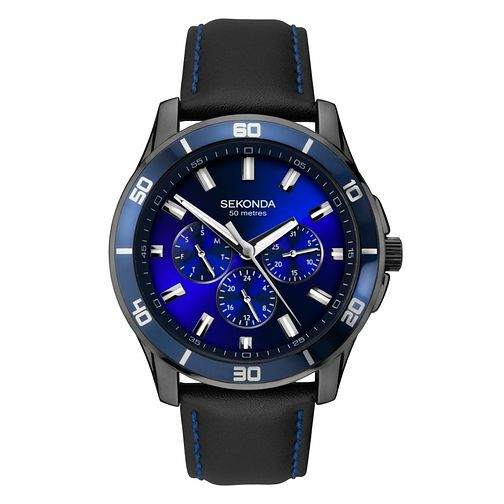 The Sekonda Midnight Blue men’s multi-function watch is the perfect timepiece for men with a bold, on-trend style. This watch features a gun metal plated case with a dark blue top ring housing a matching sunray dial. The timepiece is fastened with a black leather strap with vibrant blue stitching that sits comfortably on the wrist. With functions including a day/date display, 24-hour read-out and water resistance to 50m, this watch will perfectly suit your varied lifestyle. Sekonda Midnight Blue Men’s Multi-Function Watch is rated 4.8 out of 5 by 35. Rated 5 out of 5 by Anonymous from Birthday Present Very nice well made and well received birthday present for my husband who needed an every day watch for work. It looks great and is very practical. The blue stitiching on the strap is a nice added touch. Very speedy delivery.